Update: Artificial intelligence specialist Kensho has raised an additional $33 million in new funding, according to regulatory filings filed last week. The $47.8 million figure originally reported includes $15 million raised in November 2014 in a round led by Goldman Sachs. Investors in the most recent capital infusion were not specified. The latest investment takes Kensho’s total funding to more than $58 million. Kensho’s previous investors include Accel Partners, Devonshire Investors, General Catalyst Partners, Google Ventures, New Enterprise Associates, Promus Ventures, Work-Bench, and Xfund. From left: Kensho’s Adam Broun, head of strategy and business development, and CEO Daniel Nadler demonstrated Warren, an interactive research environment from Kensho, at FinovateEurope 2014 in London. Kensho has built what it calls the world’s “first computational knowledge engine for the financial industry.” The company leverages massively parallel, real-time, statistical computing and advances in unstructured data engineering to create Warren, an “interactive research environment” that is able to answer more than a million queries posed to it in natural language. Portfolio managers and market researchers can ask Warren questions—such as the short-tern history of Apple’s share price after an earnings announcement or the effect of North Korean missile tests on the South Korean stock market—and get answers in minutes. Recently featured in a review of Boston-area startups, Kensho was named to OnFinance’s “50 Companies to Watch” roster in April. The company forged a partnership with NBC Universal News Group last fall, providing unique analysis to the viewers of the financial news network, CNBC. 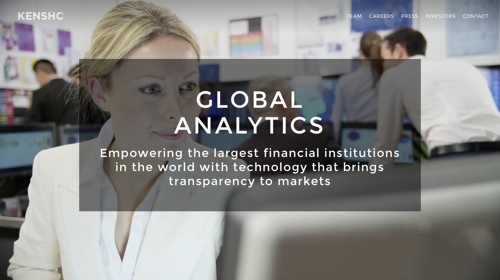 Later that month, Kensho announced a $15 million fundraising led by Goldman Sachs. Founded out of MIT and Harvard in 2013 and headquartered in Cambridge, Massachusetts, Kensho demoed Warren at FinovateEurope 2014 in London. Misys shortlisted in three different categories in the CIR 2015 Risk Management Awards. Bloomberg TV looks at Fenergo in a discussion on investment in startups. NICE Systems wins “8-figure contract” to bring call recording and incident-management technology to NYC’s Department of Information Technology and Telecommunications (DoITT). Personal Capital CEO Bill Harris writes about the rise of robo-advisors in a column for Investment News. CashStar to power digital gift card offerings from Maritz Motivation Solutions. KCUR 89.3 FM interviews EyeVerify CEO Toby Rush. In the world of promising young startups, there are far worse things than having Goldman Sachs as your largest investor. Just last week we announced that NBCUniversal News Group had forged a strategic partnership with Kensho, the global analytics and intelligence systems specialist. This week we learn that Goldman Sachs has taken the lead in a $15 million investment in the company and is now Kensho’s largest investor. According to a source cited in Forbes discussion of the news, the investment puts Kensho’s valuation “in the 9-figure range.” Combined with the company’s previous funding, Kensho’s total capital raised stands at more than $25 million. Kensho leverages massively parallel statistical computing on unstructured data to provide financial analysts with real-time responses to complex questions. It’s partnership with NBCUniversal will include deploying a Kensho Stats Box for use by journalists at the financial news network, CNBC. And rumors and opinions are already swirling about how the notoriously savvy Goldman Sachs may use the technology. Writing for Business Insider, Mike Bird suggested that Kensho “should have analysts quaking in their boots” for fear of losing their jobs to the Siri-like intelligent virtual assistant. Over at The Financial Times, Tracy Alloway and Arash Massoudi cited analysts who said that the move is largely a cost-cutting one – which may or may not calm the nerves of Bird’s quaking analysts. The Financial Times also reported that Goldman Sachs played at least a small role in convincing the company to change the name of its signature implementation of the technology from “Warren” to “Kensho”, the same name as the company. Recall that “Warren” was the name of the platform when it was demoed at FinovateEurope 2014 back in February.